CABANATUAN CITY, Philippines (CNN) -- Typhoon Parma crossed the northern tip of the already storm-battered Philippines Saturday afternoon and early Sunday, killing three people, according to local media. 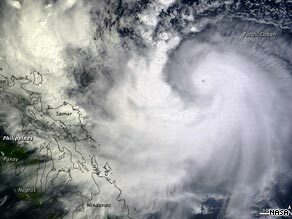 A NASA satellite image shows Typhoon Parma as it headed toward the Philippines on Friday. Parma made landfall Saturday afternoon in a rural region of fishermen and farmers in Luzon, the largest of the Philippine islands. Tens of thousands of people to fled their homes for safer shelter. Winds whipped the coastline and felled power lines in northernmost Cagayan Province. Debris littered the roads, making evacuations even more difficult. At 5 a.m. Sunday (5 p.m. Saturday ET), Parma, known locally as Typhoon Pepeng, had maximum sustained winds of 120 kilometers per hour (75 mph) with gusts as high as 148 kilometers (92 mph) as the eye began to leave land, heading to the northeast, according to the U.S. Navy's Joint Typhoon Warning Center. Parma avoided a direct hit on heavily populated Manila, but the real menace in the Philippines capital was not wind. It was water, and there was no escape from it. Parma was expected to dump as much as 8 to 20 inches of rain in areas still water-logged from last week's Typhoon Ketsana. That storm resulted in the heaviest rainfall in 40 years and at one point, 80 percent of Manila was submerged. Defense Secretary Gilbert Teodoro appealed to Filipinos to remain in shelters even if they were in cities and towns not directly in Parma's path. He said he was worried about massive flooding and possible mudslides in mountainous regions. The government deployed 10,000 troops to help with rescue and relief operations as frightened Filipinos prepared for the worst. World Vision, the Christian humanitarian organization, was planning to launch relief operations Saturday evening in Isabela Province, one of the areas slammed by Parma. The group also plans assistance for nearby Cagayan province, whose capital, Tuguegarao, is being hit hard by Parma's strong winds. Arturo Fidelino, a telecommunications executive in Manila, described panicked people rushing to stock up on essential goods -- drinking water, canned food and electrical supplies. "We had a traumatic experience when we had Ketsana," he said. "We don't want that to happen again." President Gloria Macapagal-Arroyo placed the country "under the state of calamity." Macapagal-Arroyo said disaster-relief crews in vulnerable areas must be equipped with life-saving kits, boats, portable generators and trucks. Ketsana, which swallowed whole houses and buses over the weekend, killed 246 in the Philippines. It later strengthened into a typhoon. An additional 38 are missing, the National Disaster Coordinating Council said. The storm affected nearly 2 million people and forced the evacuation of 567,000. CNN's Eunice Yoon and Pamela Boykoff in Cabantuan City, and Josh Levs in Atlanta contributed to this report.